Choices, choices SO many choices. All day long. Decision upon decision. Choice after choice. What do I eat? What do I say? How do I say it? What to do? Where to go? Who to see? To interact with? Do I believe that? Is this true? How do I act and react? Do I go to work/school/church? Is it time go to bed? What time to wake up? Do I hit the snooze? One time, 2 times, 5 times? Do I lay in the bed or spend time with God? The average adult makes an estimated 35,000 choices per day (227 of them on food alone). A choice every 1.5 to 2 seconds, depending on how much you sleep. In comparison, we breathe every 3.5 to 5 seconds. So, for every breath, we make at least 2 choices. All these choices – dizzying. Some choices appear to only affect the next few seconds, minutes or hours. Others life-changing decisions, altering the course of our future and subsequent decisions we will face. All these choices – exhausting. No wonder, at times, we feel overwhelmed by the decisions, all these choices, we must make. To compound the matter – EVERY single choice MATTERS. There are no benign choices. Each choice has consequences – good and bad, immediate and long-term. Each and every choice has repercussions. Not confined only to the decision maker but widespread. Every decision has a ripple effect. It’s consequences flowing out to our family, our friends, through our entire sphere of influence. Some just barely a crest in the water. Others the tides altering the landscape of our life gradually over time. Still others a tidal wave with immediate long-lasting, destructive consequences. These repercussions, these consequences not just for today, tomorrow or next week, but for generations to come. Perhaps even for eternity. Count the Benefits. Weigh the Costs. What? What are you saying? Each choice I make has far-reaching earthly consequences? Potentially eternal consequences? Aren’t you taking this too far? Is this an exaggeration? NO!! So how does my choice to eat a candy bar affect my children? Using my time wisely or having my quiet time affect my friends? Binge watching Netflix affect eternity? How do these choices affect my grandchildren and generations to come? Well… let’s walk this out. Hopefully, we can grasp the effects our choices have on us, at least in the present and the immediate future. We eat junk food. Get a sugar “high” for a bit and then crash. Use our time wisely, get tasks accomplished and are motivated to continue. Have our quiet time, we connect with God and His Word and are more likely to be led by the Holy Spirit as we go about our day. And so on. 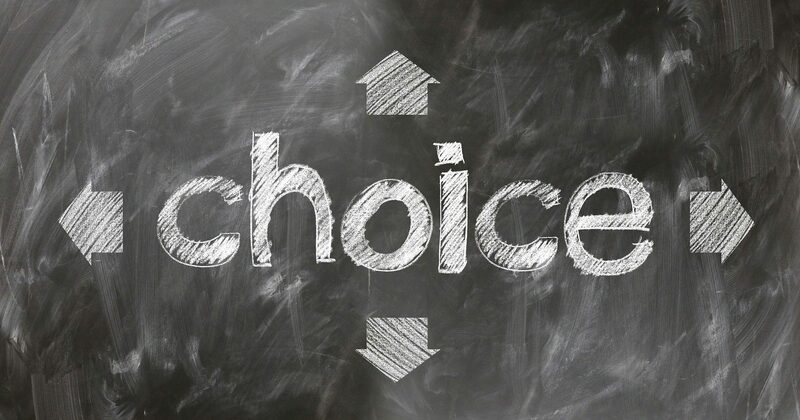 When a choice results in an immediate benefit or cost, it is usually easier to make a beneficial choice. However, sometimes we choose the instant gratification instead of the best choice. We are not thinking about the costs only the quick fix benefit at the moment. Two examples – eating a candy bar and the distractions of “entertainment”. One candy bar will not likely long reaching or eternal consequences (unless you are allergic or have a life-threatening medical condition). However repeatedly choosing to grab a candy bar, even if done infrequently, has a definite impact on our future. Especially when done out of emotion, in response to our circumstances, or when filling a void. When we make one bad choice, it becomes easier and easier to make the next bad choice. Then the next and so on. The same is true for good choices. Repeated choices, good or bad, become habits. A habit is defined as “an acquired behavior pattern regularly followed until it becomes almost involuntary”. Involuntary good habits from good choices are great!! Involuntary bad habits from bad choices equals opening the floodgates to the ripples and waves of repercussions into our lives and the lives of those around us. So how does the choice of eating a candy bar (or your junk food of choice) affect our lives and all those in our sphere of influence down through generations? WELL for starters too many candy bars means weight gain… I know duh, right. Gain enough weight and we can’t run after our children or play with them on the floor, much less grandchildren. Blood sugar highs and lows mean high and low moods and energy. Which in turn affects our family and anyone we come in contact with (especially during the lows. Can I get an “Amen!”). Often the answer to cure the lows – eat more sugary foods to increase mood and energy, which means more weight gain, leading to health issues (diabetes, high blood pressure, etc.). Maybe we choose to sneak the candy bar. Buy and eat it in the car so no sees. Secrecy impairs our confidence, our self-esteem. (And the enemy will be glad to add some guilt and condemnation to our plight.) Decreased confidence impacts our relationships (how we interact with others, marriages, friendships), how we see and carry ourselves. It can impact our calling and destiny as we withdraw from society out of shame or guilt. Now our quality of life, of our relationships, of our health all decreased for a candy bar. Alright, one more… We have a multitude of choices when it comes to distractions and entertainment. Any of which can be done in excess, much less combining several. Binge watching Netflix, scrolling through the many social media outlets, surfing the net, playing video games, whatever your distraction or entertainment of choice. Days, months, even years of our lives wasted – distracted and entertained. Before you start throwing rotten tomatoes, I am not saying we cannot relax and enjoy ourselves, blow off some steam, or watch a little TV. And I am all for social media. I think it’s a great tool and a way to reconnect or stay connected with friends and family. So check in… Have I spent time with God today? Have I prayed, spent time in the Word? Have I encouraged a friend or family member today? Have I prayed for them, for all my family, for my church, for my nation? Is the Holy Spirit prompting me to do something else with this time? Then do it. 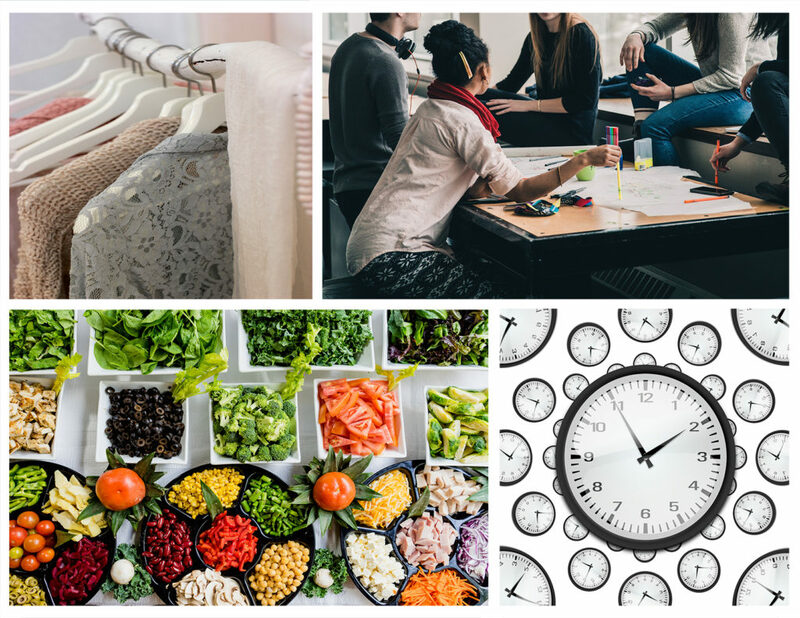 Choosing to waste time with distractions and entertainment could have immediate, long term, even generational consequences, for us and for others. Did we miss our God-given assignment today, that divine connection, meant specifically for us? All so we could partake in our distraction? Yes God CAN find someone else to talk to a neighbor about her marital problems. Another sister who will also witness to her about Jesus, detail for her the sovereignty and promises of God. Plant a seed that leads to salvation for her and her family. But do we want to miss that assignment to watch an episode (a rerun no less) of “The Office” or “Fixer Upper”? Is scrolling through social media more important to us than making a divine connection with our waiter at the restaurant? Let’s make the better choice, the Spirit led choice, so we don’t miss our assignments or the blessings that come with them. How do we make good choices, better choices, the best choices? First, we acknowledge every choice matters. It matters to God. It matters for our family and hopefully, it matters to us. We need to settle this in our heart, soul, and mind. So when temptation or hard choices come we understand whatever we choose has consequences. Does that mean we will never make mistakes? Never make a bad choice? A wrong choice? No, of course not. Perfection is not an option, not even a choice. But pressing towards God and His best for us is. Next, seek God. Pray about the choices. Check in with the Holy Spirit. Right about now you are probably thinking, “Didn’t she say we made a choice every 2 seconds? How can I possibly stop to consult God for half or even a quarter of those choices?” This, this is when the Holy Spirit- our Helper, Comforter, Advocate – comes to our aid (John 14:26). Why it is imperative to have God’s Word stored up in our heart, mind and soul. To fill our tank each morning, spending time with the Lord and in His Word. Then we can use all these resources to guide our decisions. To help us make the better choices. 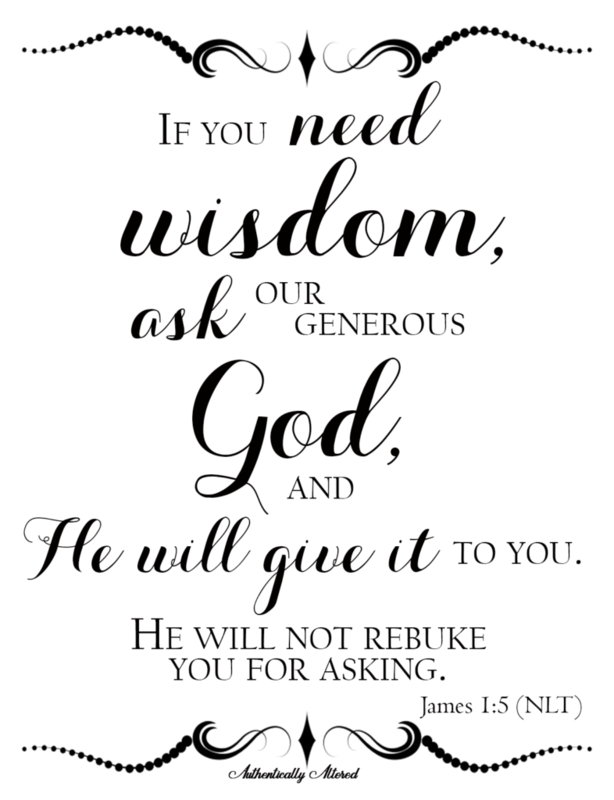 We can also ask God specifically for wisdom (James 1:5). When we feel like we need a little more guidance with a choice. A tangible option to confirm what we sense from the Holy Spirit. We can also filter or test each choice, each option for a decision with the Word of God. Testing each choice, through the lens of scripture, will keep us God-focused. Our motives in check and us centered on the only One who can meet our needs. 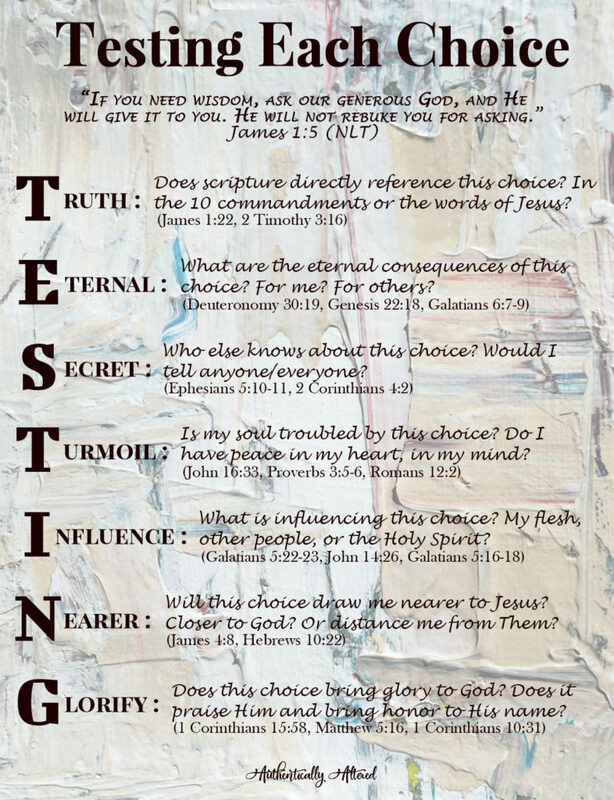 When TESTING choices, we can evaluate each choice based on these questions to check their alignment with scripture, to check our motives, and assess the consequences. Does the Bible directly reference or address this decision or choice? Is it covered by the 10 commandments or in the teachings of Jesus? What are the eternal consequences of this choice? Does it impact my family? What about future generations? Does my choice have an effect on my current or future blessings? Click to access Subscriber Library for Printable PDF. Who else knows about this choice? Would it bother me if others knew about my choice? Am I hiding my choice from anyone? Would I tell everyone about this choice? Is my soul troubled by this choice? Do I have peace in my heart, in my mind? Is my spirit at ease with this choice? Will I have any regrets regarding my choice? What is influencing this choice? Is it the cravings of my flesh? Am I trying to please or impress others? Is competition or comparison driving this choice? Or is it Holy Spirit led? Will this choice draw me nearer to Jesus? Will it bring me closer to God? Or will this choice distance me from God? Will it hinder my growth in Christ? Does this choice glorify God? Does it bring praise to Him? Does it bring honor to His name? As we begin to make choices based on God’s Word, He will give us strength and courage to continue to make better choices. The Holy Spirit will guide and direct us to the best choices to keep us moving forward in our walk with God.